It starts with the flutter of a Hemlock bough, almost imperceptible. It registers for the briefest moment and falls into some unlabeled file in the back of the mind. It’s subtle, quiet, it’s how every storm begins. Now two hours later the waters of Blackney are streaked with white caps and the young hemlock bends at the waist. Harlequin ducks make a desperate gambit from one cove to the other, riding breakers two to three times bigger than they are. They’re tough little things, impervious to the weather. Whatever is in the next cove over, I hope it’s worth it for them. After a week and a half of sun, the clouds feel intrusive, cutting into our precious allotment of daylight. The roar of the ocean feels deafening after a week of calm seas. A week that gave us the chance to return to the orca’s holy land, Robson Bight. On the map, Robson Bight appears as just a little divot in the Vancouver Island shoreline, unassuming and natural. But it’s here, in the back of the bight, where Erich Hoyt camped in the 70s. Fearless and casual, he’d sit in his row boat in the dead of night, floating on the tide, waiting for the orcas to swim by. As we cruise across the mouth of the bight for the site of the hydrophone on the east side, I try to imagine how I’d feel. What would it be like, to float on blackness, thin paneled wood between me, the ocean, and 15 behemoths? After hours with whales, many of them with nothing but fiberglass separating us, I’m not sure I’m ready to surrender my primary sense when we meet. The site of the hydrophone in Robson Bight is on a steep cliff that drops straight into the ocean. It doesn’t descriminate, picking up the sound of tugs as soon as they clear Weynton Passage some five miles to the west. At Orca Lab we call it the Critical Point hydrophone. After the whales enter through Queen Charlotte Strait, it is on this end of the bight that they choose to either continue east into the strait, or turn back to the west toward the lab and open ocean. But now, in the quiet stillness, nothing seems critical or pressing. Brittney and I relay the car batteries up the cliffside. Critical Point is the most vital but also the most susceptible hydrophone in the array. It has the widest range, but its solar panels are draped in shadow for most of the winter by the massive mountains at the back of the bight. For five nights we’ve been nudged awake by the unmistakable chirps of a hydrophone about to run out of power. Invariably it’s Critical Point that needs to be extinguished, leaving us sonically blind in most of the strait. It’s easy enough to swap the batteries and install the new ones, all one needs is a wrench and an understanding that touching positive and negative terminals will lead to the shock of your life and possibly frayed eyebrows. Batteries firmly in place, I call Paul. “Where are you now?” He asks, you can always hear a smile in his voice. I grin back and fall into the moss putting my feet up on the rocks, drinking in Robson Bight, the rays of sun cutting through the mountains, anointing them with breathtaking halos. “Just on the Critical Point cliff, soaking in the sun.” The honor and novelty of being here, of working for the guy that wrote the book on Orca behavior is never lost on me. This is so cool. An hour later we’re riding the ebbing tide to the west, I’ve memorized the strait like some learn city blocks. There’s the cliff, always dead heads on the ebb coming around the corner. The Sophia’s, reef off the west end. Nice deep water off Cracroft Point. We round the corner into Blackney Pass, the water churning as it rushes for the open maws of Blackfish Sound and Queen Charlotte Strait. Miniature whirlpools splatter the entrance, a heavy tide rip in the middle. I can count on one hand the number of times I’ve seen Blackney in a state that I’d be willing to kayak. The water never rests. Gulls, murres, guillemots, and murrelets manipulate Blackney’s upwelling, dive bombing for forage fish pulled to the surface. Off to the right is Barontet Passage, a long slender channel that runs east on the northern end of Cracroft. The resident orcas never go that way, but occasionally the transients – what was that? Without bothering to slow down I yank the wheel to the right, turning ninety degrees, the bow pointing toward the opening of Baronet. A hundred yards later I slow down. Something caught my eye. Something bigger than a sea lion. I think it was just a humpback, there’s been a couple hanging out between Parson and Cracroft. “It’s an orca.” My heart stops, resets, and accelerates. Brittney’s already digging for the 400mm lens. I don’t mean to say it with such intensity, but I can’t help it. Eight years later, orcas still do this to me. May they always. I turn the boat so they’re on our port side. The boat we’re in is only about ten feet long and when you sit, you’re barely four feet above the surface. You may as well be in Erich Hoyt’s row boat. And on the rambunctious currents of Blackney, you couldn’t ask for a worse platform to photograph. “Can’t you keep it level?” Brittney asks as the orcas-four in all-break the surface. The group heads the same direction we’ve just come from. I know we’re a land based research facility, but screw it. When is this going to happen again? 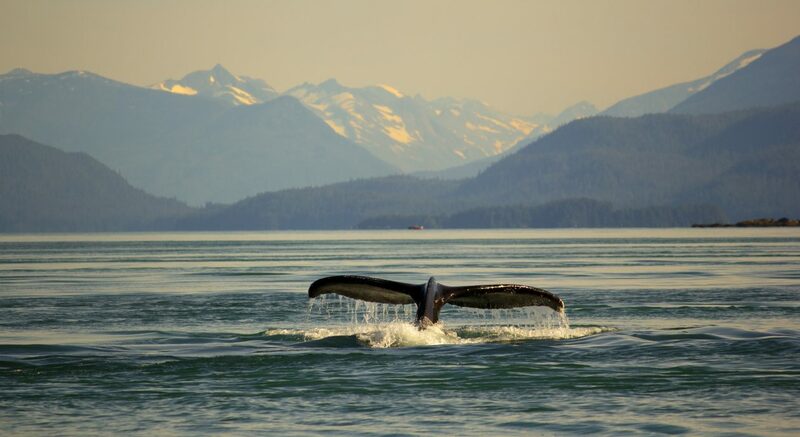 We follow respectfully, years on the whale watch boats paying off, the camera whirs to life with every surfacing. I dig in my pocket, and one hand on the wheel, both eyes looking out the window, call Paul again. I hear the smile in his voice as we round Cracroft Point and once again, travel east into the strait.